Last year I read a book that gave me the idea to come up with a word for each year. I was so excited to finally get to do this exercise this year. Now that we’re half way though January I finally have my word. Better late than never right?! My word for 2013 is MERCY. I think I need more mercy in my life. I need to practice it, show it, and give more of it. I want to live as a merciful person. I want a merciful life. I want to judge less and open my heart more. I want to understand what others are feeling and know where they are coming from. I want to be reminded that every person out there is fighting their own battle and we have no clue what that battle is, unless they choose to share with us. Each of us has a different back story filled with different childhoods, the ups and downs of our teenage years, those awkward high school years and whatever mess we got into post high school. 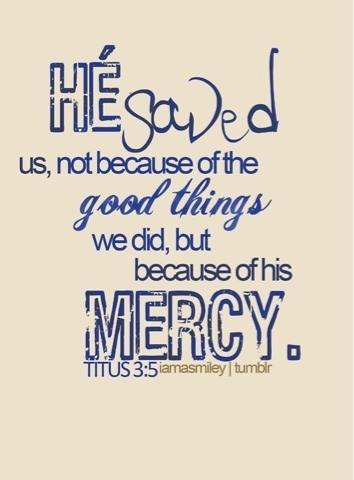 I want to stop feeling as though I’ve failed and remember His mercy. Then I want to be able to take that same Mercy He gives to me and give it to my husband, my children, my family, and friends. How great a feeling to know we’ve given someone mercy rather than judgement and condemnation. I’d much rather be clothed in mercy than designer labels. My point is is that we all need a little mercy in our lives, and some of us need a lot. I feel like I need a lot, and am hoping at the end of 2013 I will be a better person for choosing this word. What’s your word for 2013? A thought provoking post. Trying to narrow my words down to only one is hard, but I think the top two for this year would be 'Thankfulness' and 'Positivity'. I'd like to be more thankful for all the wonderful things in my life and to be a more positive person, in what I do and how I think.